The elderberry is loaded with flavonoids, antioxidants, minerals and vitamins such as fiber, iron, potassium, manganese, folic acid, beta-carotene, and vitamins A, B6, and C.
The elderberry (Sambucus canadensis) is a small, deciduous tree with white or cream flower clusters and dark berries that is widespread in the cool climates of United States and Canada. However, the elderberry tree is native to Europe and parts of Asia and Africa. The elderberry is loaded with flavonoids, antioxidants, minerals and vitamins such as fiber, iron, potassium, manganese, folic acid, beta-carotene, and vitamins A, B6, and C.
The elderberry has varied uses including as an ornamental shrub, in cooking (to flavor foods, in wine preparation), and for its wide-ranging medicinal properties since ancient times such as to improve skin tone, fight flu, treat respiratory infections, and boost the immune system. Both the flowers and cooked berries of the elderberry tree are used in medicinal preparations. Uncooked berries contain certain toxic chemicals similar to cyanide. 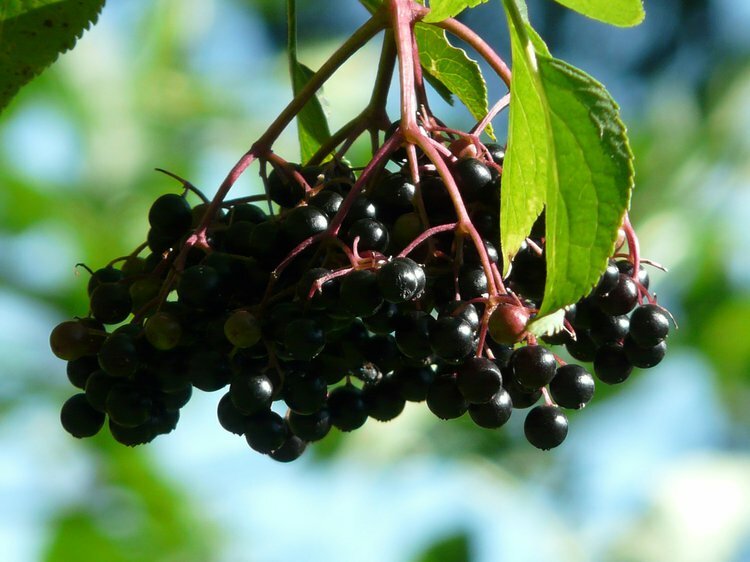 The University of Maryland Medical Center informs that pregnant women and lactating mothers should avoid elderberry preparations and extracts. The elderberry can help fight common respiratory infections, such as the common cold and flu, by improving the symptoms (like fever, sore throat, muscle pain, body pain, and cough) and restoring one’s health quicker. Elderberries prevent swelling of the wind pipe and nasal passages, thus reducing breathing discomfort. Thus, it can also help individuals who are suffering from asthma and bronchitis. As per a publication in the Journal of International Medical Research, flu patients who were on a dosage of elderberry syrup showed better progress and recovered from the flu 3-4 days earlier than those who were not on such elderberry supplements. Elderberries have been also known to fight various influenza strains such as the bird flu and swine flu. Tests conducted by Retroscreen Virology at the University of London, have shown that the avian bird flu strain H5N1 could be effectively controlled (up to 99%) by elderberry extracts. The elderberry has a rich mix of vitamins, flavonoids, and powerful antioxidants that help build and naturally boost the immune system. Compounds in the elderberry protect the body from free radicals, which can severely damage healthy human cells and cell components. According to Germany’s Federal Research Institute for Nutrition and Food, flavonoids, like anthocyanins found in the black elderberries, have significantly greater antioxidant capacity than vitamin C. Vitamin A and vitamin C found in the berries are beneficial in preventing certain acute and chronic health conditions. Elderberry cosmetic extracts from the flowers have been used to soften and restore skin tone and complexion. The flower extracts can soothe and offer relief from any rashes, sunburns, and skin burn. Due to their antiseptic properties, elderberries also make an excellent face and eye wash. This property has been used to treat wounds, eye inflammation, and conjunctivitis. Zafra‐Stone, S., Yasmin, T., Bagchi, M., Chatterjee, A., Vinson, J. A., & Bagchi, D. (2007). Berry anthocyanins as novel antioxidants in human health and disease prevention. Molecular nutrition & food research, 51(6), 675-683. Schmitzer, V., Veberic, R., Slatnar, A., & Stampar, F. (2010). Elderberry (Sambucus nigra L.) wine: a product rich in health promoting compounds.Journal of agricultural and food chemistry, 58(18), 10143-10146. Sidor, A., & Gramza-Michałowska, A. (2015). Advanced research on the antioxidant and health benefit of elderberry (Sambucus nigra) in food–a review. Journal of Functional Foods, 18, 941-958. Thole, J. M., Kraft, T. F. B., Sueiro, L. A., Kang, Y. H., Gills, J. J., Cuendet, M., ... & Lila, M. A. (2006). A comparative evaluation of the anticancer properties of European and American elderberry fruits. Journal of medicinal food, 9(4), 498-504. Charlebois, D. (2007). Elderberry as a medicinal plant. Issues in New Crops and New Uses. ASHS Press, Alexandria, VA, 284-292.